It is like the Little Rascals, but with white slavery. Although best known for the lunacy of House, Nobuhiko Obayashi can do it all, but he puts his unique stamp on whatever genre he takes on. On the surface, this film might resemble a shomin-geki (“home drama”) much like Ozu’s I was Born but . . ., but the primary school students eventually band together in hopes of saving the village bully’s stepsister from being sold into prostitution. 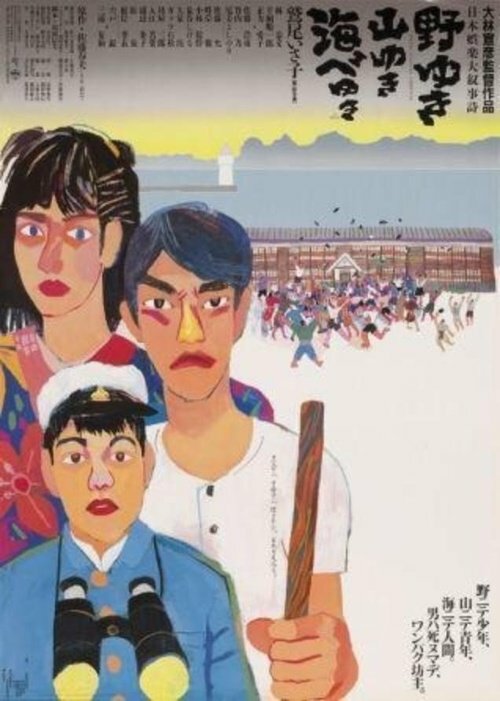 Imperial pre-war societal values take it in the shins during Obayashi’s Bound for the Fields, the Mountains and the Seacoast, which screens during the Japan Society’s Obayashi retrospective. Sudo Sotaro is the sort of annoying brat who always encourages mischief, but always manages to look innocent when their teacher eventually tries to re-establish some discipline. Transfer student Sakae Ohsugi isn’t having any of it. He intends to make Sotaro pay for all the trouble he causes. However, the older boy’s beautiful step-sister Shoucho takes a shine to Sotaro and tries to broker peace between them. It will take quite a while and an extended sequence of war games before the two rivals finally bury the hatchet. Eventually, they will make common cause when Ohsugi’s sleazy parents sell Shoucho to the local brothel. Naturally, Shoucho is quite popular in town. The local recruiting officer has his own designs on her, but she has fallen for the village’s conscientious objector. Unfortunately, the two of them do not exactly make a power couple. That is why Sotaro must take matters into his own hands. Bound functions quite well as a coming of age story most viewers will easily relate to, even though few of us ever prosecuted a war against a mobbed-up bordello when we were ten. Obayashi occasionally gives the film a wild stylistic twist, but he is always scrupulously restrained compared to the bedlam in House. Still, Bound never looks like the work of a shy filmmaker, especially down the stretch. Nor is he subtle in his critique of imperial militarism or the middle class timidity he clearly blames for allowing its rise. There is no doubt Obayashi came to play, as did the wildly charismatic Yasufumi Hayashi, who brings boundless energy to the wide-eyed Sotaro. Isako Washio is not exactly the dead ringer for Setsuko Hara some descriptions suggest, but she has a similarly radiant warmth on-screen. She makes the tragedy of Bounds exquisitely so. Jun’ichrȏ Katagiri’s Ohsugi slow burns impressively for his age, but he is no match for either Hayashi or Washio, who have him bookended on both sides of the acting spectrum. It is impossible to imagine a coming of age film like Bound getting produced in 1980s Hollywood. The general tone is not unlike Lord of the Flies, but with clueless John Hughes adults ineffectually wandering about. Yet, it is an oversimplification to argue the children should be in charge, because they do not do much better amongst themselves. Darkly distinctive and compelling, yet always strangely entertaining, Bound for the Fields, the Mountains and the Seacoast is a rather amazing film. Very highly recommended, fans of House (which duly kicks off the series this Friday) should see it while they have the chance. It screens this Saturday (11/21) at the Japan Society in New York.